Sharing the joy of aviation with children from age 4 to 104. 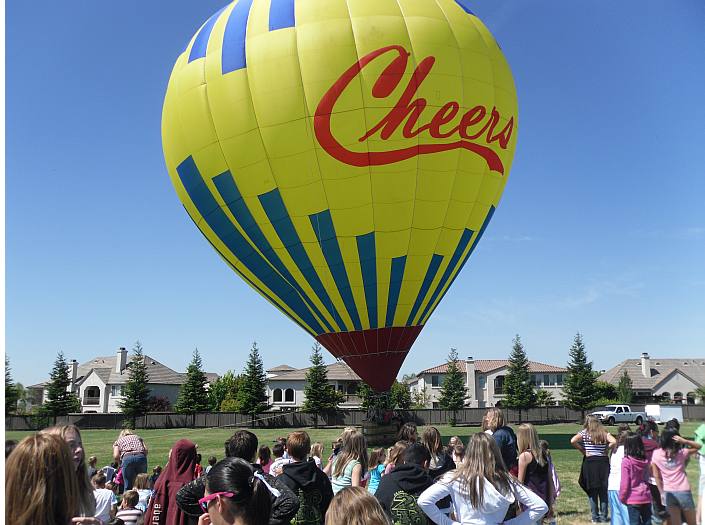 Our hot air balloon school presentations are the perfect supplement to science and history classes. Our presentation consists of two components, a 30 minute talk on the science and history of ballooning followed by a field demonstration and inflation of the hot air balloon equipment (weather permitting). The presentation will last approximately 1 - 1 1/2 hours and the school may select the "best behaved" children to stay after and assist in the pack up of the balloon as special "Cheers Balloon Team" members. Don't have room to inflate the balloon or weather is an issue? No problem! We can bring the balloon equipment indoors for a classroom session or even do a partial inflation in an auditorium. Our Cheers Aerial Media School Presentations are great for the whole school and families too. We are happy to provide advance information so teachers can prepare their students, even make it part of a science, art or history project. If you desire, we're happy to share this event with parents too so don't hesitate to invite them out. mankind's earliest form of flight. Above: Cheers Hot Air Balloon pilot giving school children a look inside. What is required for a school presentation? All "full inflation" balloon operations take place at the beginning of the school day in order to take advantage of the cool and stable conditions of the morning. Scheduling must be made with this in mind. Upon arrival, the balloon will require a minimum 200' diameter area free of power lines, lamp posts, trees or other obstructions. The balloon will require at least two vehicles in addition to the balloon support vehicle to use as tie off points. 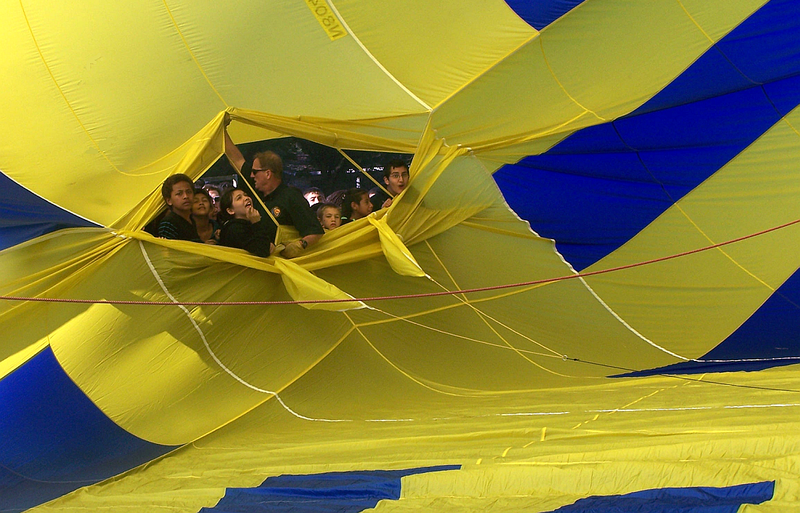 We would like to have a few (2-4) able bodied volunteers to assist as crew for assembly and disassembly of the balloon. Should weather conditions or available area prevent the outdoor inflation of the balloon the pilot will assemble enough of the equipment as to provide an educational and entertaining assembly for the students. Ready for this at your school? A child's eyes are windows to the soul and keys to our future. Our team is ready to come to your school and share the dream.